Articles→Breaking News→How Did Jean Northenor End Up In That Meeting? How Did Jean Northenor End Up In That Meeting? So how did Kosciusko County’s legendary lady of local Republican politics get involved in the Scott Whitaker ordeal? That’s what City Councilman Jeff Grose was wondering Monday night. The former Indiana Mr. Basketball on Monday let loose on an arcing shot at the Warsaw City Council meeting as he simmered over what he believed had become the politicization of the Jan. 25 incident involving Warsaw Police Chief Whitaker. The District 1 councilman asked councilman Michael Klondaris during the meeting how Jean Northenor found herself in a meeting with Klondaris and fellow councilman Jack Wilhite as they met to apprise Mayor Joe Thallemer of their concerns with Whitaker. From a distance, some might have assumed the councilmen invited Northenor, but that wasn’t the case. Northenor, the former longtime K-County GOP chair, called InkfreeNews Tuesday afternoon to clarify. Turns out she already had a meeting lined up with Thallemer, who she considers a friend. She said she had heard the rumors of flying around concerning Whitaker and she wanted to offer a little advice. The issue appears to have died down, but will likely be remembered as one of the most contentious internal battles within the all-Republican council in years after Klondaris raised the issue of an independent review. CITY COUNCIL NOTES – Monday’s City Council meeting, highlighted by the lengthy discussion about the Whitaker saga, proved popular on the city’s live stream service. As of Friday, the meeting had 670 total views, including 157 people who tuned in later to watch the recorded version. The previous total record of 145 views was set last year for city council’s big sewer rate hike meeting. 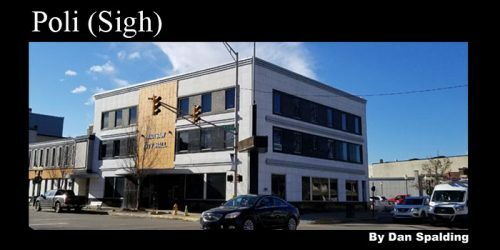 David Findlay, president and CEO of Lake City Bank, gave a presentation at the same meeting on the bank’s $8.2 million investment in its seven (yes, seven) downtown properties over the past three years. The bank employs 235 people in the immediate downtown. Overall, it ranks as the 225th largest bank in the nation, according to Findlay. Umbaugh and Associates has merged with and become known as Baker Tilly, a global firm with headquarters in Chicago. Umbaugh has provided services to the city and other local government entities for years. A representative gave council an update on the firm’s municipal services. City council will meet at 7 p.m. Thursday, March 28. Normally, they would meet a week later, but spring break plans required the change. ELECTION NOTES – As of today (March 23) the May 7 primary day is 45 days away. Republican Mayoral Challenger Ron Shoemaker is already putting up yard signs, including one at GOP headquarters. I’m told signs for incumbent Mayor Thallemer’s campaign could start popping up within days. Deadline to register to vote in the primary is April 8. CONGRESSIONAL NOTES – Indiana’s U.S. Sen. Todd Young is ranked as the 7th most bipartisan Senator, according to The Lugar Center. Indiana’s 3rd District Congressman Jim Banks hosted town hall meetings in Huntington and Montpelier in the past week. I doubt anyone tracks it, but if there was a list among Indiana Congressional delegates in terms of hosting town halls, Banks would likely be at the top. The end is near for the old city hall. 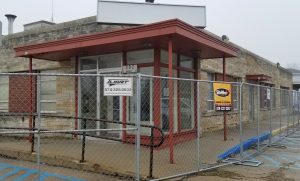 TICK, TICK, TICK – Passersby on Market Street in Warsaw this week probably noticed a fence has been erected around the old city hall at the corner of High Street — a clear sign the building will soon be torn down. DeWayne Busz, the facilities manager for Warsaw Evangelical Presbyterian Church, an adjacent property owner which bought the building last year with plans for expanded parking, said demolition could begin in the next few days. On Thursday, a police SWAT team used the building for training, Busz said. Reporter Dan Spalding covers city government and politics for InkFreeNews.com. He can be reached at [email protected] or at (574) 855-7612.